Today, February 21, is Ben’s birthday. I woke up feeling so down that I didn’t want to get out of bed. This is the third birthday without him, so I asked myself how many of his birthdays I am going to feel like this. The truth is that I have gotten used to the waves of sadness and loneliness. I didn’t know how I would feel today but I go with the flow of my emotions. I don’t convince myself that I have to be miserable, I don’t punish myself, and I don’t anticipate anything other than that I don’t know how I am going to feel and that I will be okay with whatever mood hits. The sadness and loneliness don’t paralyze me the way they did, but the bursts of tears remain. I miss Ben and I think that’s okay. I miss making a fuss on his birthday. When he was homebound, I decorated our apartment after I put him to bed so he would have a fun surprise in the morning. He knew I was decorating but never knew exactly what he would find, and that delighted him. In an effort to continue to make a fuss over Ben, I made a plan for today to honor him and our relationship. Making a plan was a way to prepare for the day, too. 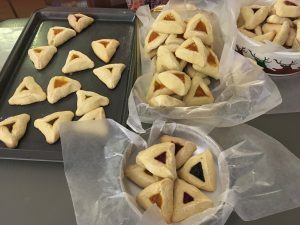 Since next week is the Jewish holiday, Purim, I decided to bake humentashen, the triangle-shaped, fruit-filled cookies. I knew Ben would like that. He loved them and was very good at shaping the cookies! Ben actually enjoyed a lot of Jewish holidays and traditions- often more than I did! He got a kick out of helping me, particularly because I used to tell him that he was better at it than my mom, who could not make that shape no matter how hard she tried. It always made me laugh to see my big, Puerto Rican man delicately making the humentashen! Grandma would have been proud of him! Ben and Grandma would be proud of this batch of humentashen. I am also in the midst of a Disney movie marathon of Ben’s favorites- Monsters, Inc., Mulan, Toy Story (1,2,3) and The Incredibles. It’s a quiet day filled with lots of memories. I also looked at the video that I made last year on his birthday, which I’ve placed here once again. 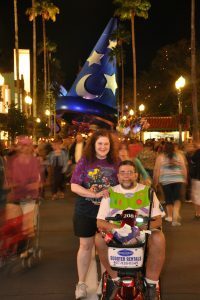 There are photos of his birthdays and other happy occasions, and, of course, some Walt Disney World photos. Some were taken when he had ALS and some in the pre-ALS days. The love was always there, so I embrace all of the memories. I guess it will always be jarring but sweet to hear The Beatles’, “Happy Birthday.” Ben woke me up with that song every year on my birthday. Now, I am playing it for him. I find it comforting to revisit beautiful memories. That doesn’t mean that it doesn’t come with tears, but tears are okay. So are smiles. I want anyone reading this to know that, at least in my opinion, there is no “right” way to deal with events like this. If I had felt like I did not want to do anything special for Ben’s birthday, and just share a quiet thought of him, that would have been fine, too. I feel no compulsion to defend myself. That, in itself, feels like progress! Although I made this plan for today, I didn’t know if it would be right for me until I was in the moment. It began shakily, but I did get myself out of bed to accomplish my goals. Thankfully, though having a “Ben day” alone with my memories and baking did not make me happy, it still felt right, and that gave me a feeling of contentment. And, Ben (and Grandma) would be thrilled that the humentashen came out very well! 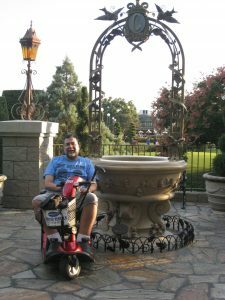 2011- A visit to the Wishing Well at Cinderella’s Castle to wish for a cure for ALS. Abby, that is so beautiful!! You two obviously had a very, very special love! Hugs my sweet friend. I am so glad that you spent the day with Ben……and he was with you, as well. What is really great about this, Abby, is that you have a storehouse of wonderful memories. Of course, at times memories can make us wistful, but often they bring a smile to our face and put joy in our heart. Thank you so much, Maureen. I’m grateful for the good memories, and grateful that they stand out more than the not so good times. It has been comforting to learn that our loved ones are always with us. Thank you very much for your kind words and for your wishes! We must all do what we can to help #FINDACURE! Sending much love!